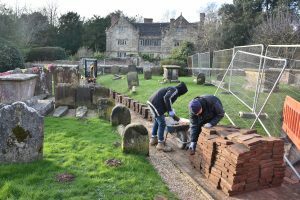 Church extension – the work begins. Trevor Swainson writes: Well, it is finally underway! So, some 30 years have passed since the idea of new facilities for St. Margaret’s Church was first mooted, If you think that this was a long gestation period, you only have to look back to the (then) new vestry that took over 40 years to become a reality in 1898. It was all a bit tense as we chased around for the vital pieces of paper to allow work to begin, all of the time with a veritable ‘Sword of Damocles’ over our heads as the expiration date of the Planning Consent loomed ever closer. 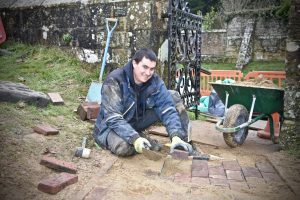 We beat the deadline with 3 days to spare before unleashing our contractors, Comber & Sons Limited to start Phase One of the Project by digging up the pathway out towards the West Gate of the Churchyard. This phase of the Project was to install a drainage pipe linking the new toilets to the mains services in the roadway. Few people would have realised that until then, the Church had no drainage connection whatsoever. At the same time as the drain was laid, we installed ducting for a new mains water supply and a conduit for electrical services. At least one of us – me! – was confident that no skeletal remains would be uncovered but less than two hours into the job, our men from Combers, Ben & George, discovered the first remains. Work immediately stopped whilst the supervising archaeologist, Dave, examined what had been found, starting off a flurry of activity as Nicol and people from the Diocese advised on the correct treatment of these finds. The archaeologist estimated that the remains were probably 300-400 years old and likely to have been buried inn shrouds rather than in coffins quite close to the surface because of the underlying sandstone bedrock. The remains have all been collected up in a proper and sensitive manner and will be re-interred elsewhere in the graveyard. This allowed work to re-commence albeit by hand rather than machine digging to complete the excavations. From the outset, we asked Combers to minimise disturbance in the area surrounding the work and this has been carried out exceptionally well. True, there were two separate attempts to sever the feed pipe from the oil tank to the boiler and, unfortunately, the daffodils at the side of the path have taken a bit of a beating but other than these minor incidents, the work has been carried out in exemplary fashion. The trench has been backfilled and the original Georgian bricks relaid as before. The path is now open as before for access to and from the West Gate to the Church. There will be a lull in work for a period of around two moths whilst further paper-chasing is undertaken and also to start the main work when the weather is likely to be better. This phase of the work is likely to take around six months, the first act of which be to demolish the existing 19th Century vestry before building the new two storey extension. 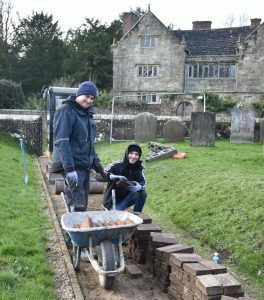 This will necessitate closing the footpath from the Lych Gate to the Church for the whole period. We apologise for any inconvenience that this may cause. Finally, with a target date of, say, the Harvest Festival, we hope to unveil the finished work for all to see.